2 built-in DVB-S2 tuners allow for an unlimited use of the 8 channels (FBC tuner). 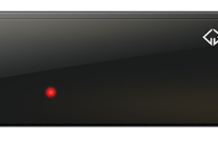 In addition, another tuner slot offers the possibility to expand the receiver with DVBS2, DVB-T / T2 or DVB-C2 Twin Tuner. The powerful processor offers the viewer a 4k high-resolution image material and an unprecedented fast switching time. Via the Gigabit Lan interface or the optional Wifi Stick, you can connect your receiver directly to the Internet. The GigaBlue is particularly user-friendly in its operating options. For example, the receiver can be controlled remotely using the GigaBlue Player app with the smartphone or tablet, without having to take the device remote control into the hand. Do you have full HD and find that you have never looked so good in quality? There’s even better! Ultra HD (UHD or 4K called), behind it is a four times higher (4×1080) picture resolution than with Full-HD. 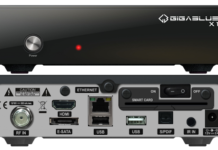 With the GigaBlue UHD Quad 4K, GigaBlue is launching its first UHD-capable satellite receiver. Enjoy TV pictures in unrivaled sharpness and clarity and experience every detail more than life-like. GigaBlue UHD Quad 4K from is simply a brilliant part, and definitely the latest in satellite receivers – be part of it! Your joy will be 8 times. FBC stands for “Full Band Capture” and means that the complete frequency band of a level is received. Two FBC tuners are fed via two satellite IF inputs (LNB1 IN and LNB2 IN), then eight demodulators are distributed dynamically to both FBC tuners. Each of these demodulators can then demodulate a transponder or an SCR frequency. You can decide when and how many programs you want to record or look at PiP. Watch a program and record up to 7 additional programs and PiP in parallel. You can also view or record additional programs via the Multiroom System. You can flexibly and easily retrofit the receiver via the module bay to receive encrypted premium offers. Simply insert smartcard with the module into the CI slot and start your pampering program. They are the boss with the GigaBlue UHD Quad 4K. Favorite series or football is running and the phone rings? Just press the pause button and decide for yourself when you want to look. Jump back up to 2 hours, enjoy scenes as often as you like or skip less interesting passages. Become a master of your program, simply by pressing a button! About network Without additional cabling, satellite TV is now also available on terminals that do not have their own satellite connection. The Sat> IP technology of the receiver delivers top-of-the-line satellite TV via the home network into every room of the household. Distribute live content throughout the house. The sun is shining and you would do nothing more than enjoy the series or football live transfer cozy in the garden? No problem! 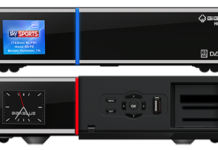 With the GigaBlue you can distribute several live broadcasts parallel in the home network and stream to your mobile devices. By integrating into your network via a network cable or WLAN you get access to all your media data – cross-space and time-independent – with any compatible terminal. Experience your personal audio and video pleasure, as well as wireless. Program your recordings easily from the road. The work has taken a bit longer or you are in a traffic jam, your favorite transmission will start in a few minutes, no need to worry! Program the recording of your desired transmission simply via mobile app or the computer at the workplace. A touch print and you know it – the entire TV program in perfect overview on your screen. In addition, you will receive short descriptions or interesting information about the program (content is station dependent) and plan your TV shows, including recordings, for the next 14 days already today – at the touch of a button. Through the USB ports, network or e-SATA you can experience your holiday pictures, favorite music or videos on the connected large HD screen. Sit back, sit back and relax. Your media is only one button away. Live TV, moments, sport highlights, feature films also natural music TV. Connect the receiver to your home cinema system via the optical output (S / PDIF) and experience rich sound. OGLES3.1 4k60 HEVC / VP9 R.A.M.